Following the success of the General Motors-engined class 202, 203 and 204 machines built under licence by AFB, the SNCB/NMBS looked to a similar source for its next diesel locomotives intended for similar duties, largely around the mountainous east of the country. This time the remit was for 1,950 hp Co-Cos, again fitted with General Motors 16-cylinder 567-series engines, but this time to be built by La Brugeoise et Nivelles (BN) and not AFB. The traditional “round nose” of their forebears was dispensed with due to developing concerns regarding corrosion, and a new more angular cab design was used. The 42 machines, designated class 205 (205.001 to 205.042), entered traffic in 1961 and 1962. Above is a link to a video uploaded to YouTube by user montzenroute showing 55s hard at work on freights on the “Montzenroute” prior to its electrification. The 205s were again a success, and led to the order of the virtually identical class 1800 for Luxembourg in 1963. Additionally, the next SNCB order for diesels for lightweight services was essentially a scaled-down, four-axle 205 – the class 212 (later class 62). In 1971, the Belgian railways renumbered all of their traction and class 205 became class 55. 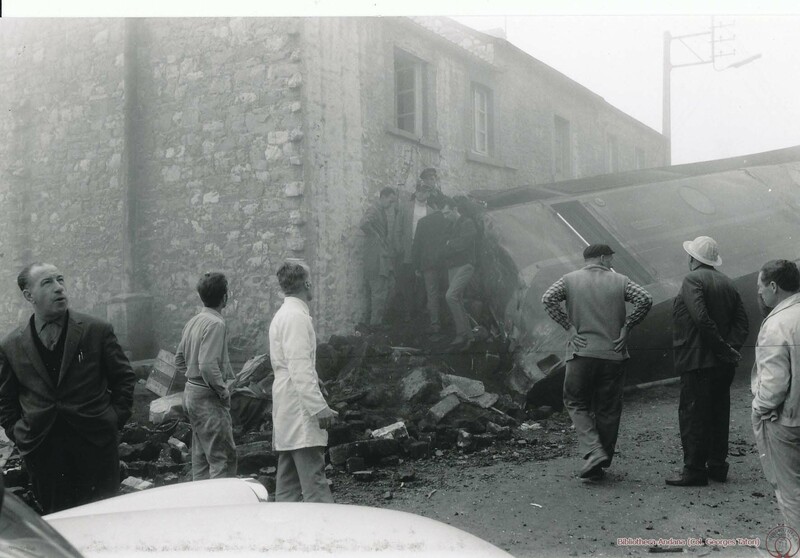 The exception was 205.016 which had been written off in an accident at Sclaigneaux on 19th October 1969 (see photo here), hence there never was a 5516. One of their duties in the hills was to haul heavy express passenger trains on the then unelectrified route between Liège and Luxembourg. In the late 1970s, seven of these machines (5505, 5510, 5515, 5523, 5529, 5540 and 5542) moved with the times when they were ETH-ed, and in order to denote this they were painted in a light blue livery that made them instantly recognisable. 5531 followed in the early 1990s (using 6215‘s redundant ETH equipment), and in 1996 5519 replaced 5542 in the “ETH” fleet. The others retained their steam heat boilers, but as they lost them, they received the Belgian standard “boule” (“dot”) in front of their numbers to denote that they were no-heat. Nowadays, with steam heat but a happy memory, all Belgian locos are “dots”. Sectorisation and electrification have removed all of the 55s’ core duties and now they have been relegated to infrastructure trains with TUC Rail or rescue duties on high-speed lines, for which they have received TVM430 signalling equipment and were made visually notable by the replacement of the thin green bodyside band with a red one (prior to their recent repaint into grey). Approximately a quarter of the fleet has been scrapped. At one point, it seemed as if 5506, 5537 and 5538 were destined to be the furthest-travelled 55s, when they were sold to Rail & Traction International and it was announced that they were headed for a new life in the Congo. However, despite 5538 receiving a repaint (photo here), it appears that the deal then fell through. The 55s have long since lost their passenger work, and opportunities to ride behind them can best be described as few and far between. 5528 performed at the “Festival” at the Chemin de Fer du Bocq over the weekend of 11th and 12th August 2018, for which it was repainted into original green livery, but there are currently not planned to be any further class 55 passenger appearances.